Metaheuristics support managers in decision-making with robust tools that provide high-quality solutions to important applications in business, engineering, economics, and science in reasonable time frames, but finding exact solutions in these applications still poses a real challenge. However, because of advances in the fields of mathematical optimization and metaheuristics, major efforts have been made on their interface regarding efficient hybridization. 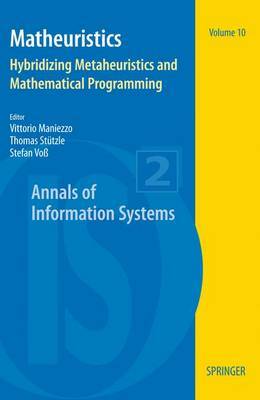 This edited book will provide a survey of the state of the art in this field by providing some invited reviews by well-known specialists as well as refereed papers from the second Matheuristics workshop to be held in Bertinoro, Italy, June 2008. Papers will explore mathematical programming techniques in metaheuristics frameworks, and especially focus on the latest developments in Mixed Integer Programming in solving real-world problems.